This #ThankfulThursday we are grateful for the quality information that medical professionals provide to CCA in our overviews. The overviews cover a number of topics from diagnoses to how to manage life with a facial difference. The newest one-sheet overview is written by Marnie Laratro, Psy.D from Joe DiMaggio Children's Hospital in Hollywood, Florida. 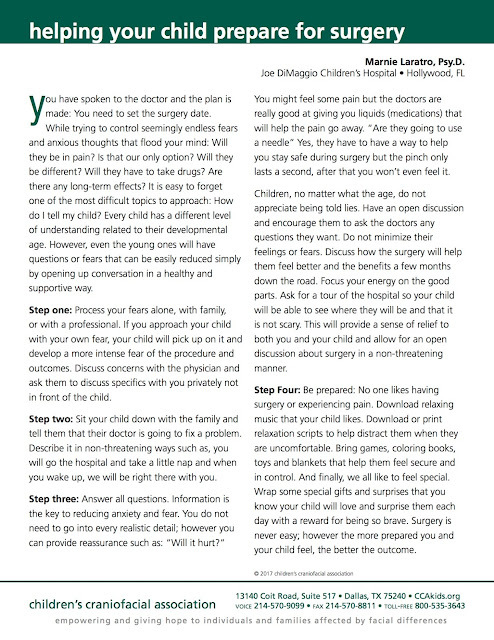 This is great advice for everyone preparing to have surgery, but especially for CCA kids. Following the series of intentional steps outlined by Dr. Laratro will easy stress and fear that come along with a major medical appointment or a surgery. Thank you, Dr. Laratro, for your advice.